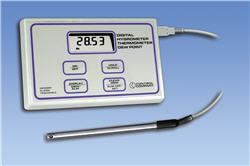 Control Company's Traceable Digital Hygrometer/Thermometer/Dew Point instrument provides a response time of under 10 seconds with a resolution of 0.01% RH, 0.01°F/°C, and 0.01° dew point °F/°C. It samples one-and-a-half times per second. Results are reported in both °F and °C from –40.00 to 220.0°F (–40.00 to 104.0°C) temperature, and from –40.00 to 140.0°F (–40.00 to 60.00°C) dew point. Temperature resolution is 0.01° with an accuracy of ±0.4°C. High and low alarms can be programmed in dew point/frost point, temperature, and humidity. When an out-of-range condition is sensed, an alarm sounds and the display flashes. Computer output permits data to be captured, transferred, stored, and printed. Memory recalls both minimum and maximum readings in dew point/frost point, temperature, and humidity at any time.